the regina mom is getting rather sick and tired of the anti-abortion crowd’s attacks on women’s reproductive rights. They don’t have a leg to stand on, and they know it, so they come out with backdoor attempts, overloaded with emotion, to restrict our access to a basic medical procedure. This from MPs Vellacott, Benoit and Lizon, which really digs into the glurge, is the latest attempt. The Sixth Estate takes it down quite handily. Vellacott’s attack follows a long string of attacks including the recently defeated Motion 312, the oft-introduced, many-named and always-defeated Bill C-537 as well as the also-defeated Bill C-484, to name a few, from the “pro-life” extremists recent years. And now, the National Post’s Jon Kay propagates on their behalf, spreading misinformation to Canadians, breeding confusion and forgetting entirely that the Canada Health Act exists. Fortunately, bloggers like DAMMITJANET! are ever vigilant, not only calling him on his lies and mistruths but also following publicizing his conniving on Twitter and blogging that, too. Lest we think bloggers and tweeps are the only ones following this, note that Liberal MP Carolyn Bennett was in on the tweeting and now has a blogpost challenging Kay’s misrepresentations. And here’s NDP MP Niki Ashton’s statement in the House of Commons from earlier this week. the regina mom is grateful for these strong women in the House of Commons as well as for those who, like the good folks at DAMMITJANET!, keep her apprised of the situation around women’s reproductive freedom in Canada. erase attitudes that build you into what you are not. until St. Brigit’s decanonization. Her fire, snuffed. A ground hog rippled across the ocean. Earlier this week the regina mom and her friend, Cherie Westmoreland, had a conversation about the prairie grasslands in anticipation of tonight’s talk, Grasslands in Peril, by Candace Savage*. Cherie said that for her, the grasslands are “a quantity of grief that’s difficult to hold.” And tonight, after having spent almost two hours listening to Candace’s presentation, “Fifty Shades of Green,” the regina mom has a deeper understanding of that grief. When we talk about land on the prairies we are talking about the people… When we talk about people on the prairies we are talking about the land… The prairie land and people are part of the same thing. From there, she launched into details about the Prairie Farm Rehabilitation Administration (PFRA), established in 1935, in the midst of the Dirty Thirties, and given five years to address emergency water issues. In 1937, the Act which established PFRA was amended to allow for the permanent management of lands. The community pastures program, 85 federal pastures consisting of 2.3 million acres of lands were set up across the prairie provinces as means to arrest soil drifting on the prairies. Of these pastures, or public ranches, 60 exist in Saskatchewan. That’s 1.8 million acres, 2,800 sections of land, an area larger than Prince Edward Island. The vast majority of this land is ancient land which has never been tilled. It comprises part of the less than 20% of the original grasslands that once existed in North America. The community pastures were established for management of local economies, i.e. to assist farmers and communities, as well as for conservation management, “to manage a productive, biodiverse rangeland.” The practices in the pastures are state-of-the-art and include considerations for “all the creatures that make a living prairie.” But with the federal government pulling out its commitment, the living laboratories may be lost. Agriculture Minister Gerry Ritz has said that the job of PFRA is done, the community pastures have achieved their goal. Candace Savage disagrees. She noted that for an eight million dollar investment the pasture program created $58 million in benefits to local rural communities, “a darn good deal.” She also noted that despite all the community pasture program has achieved, the prairie ecosystem is dying all around us — plants, animals and birds special to our piece of the northern grasslands are dying off. 31 endangered and threatened species live on the community pastures. Citing a national report, The State of Canada’s Birds, which draws on 40 years of research, Candace said that no one knows why these insectivore birds are dying off. It could be because of climate change or the loss of grassland habitat. She spoke of the whooping cranes that used to nest at Shallow Lake, near Luseland in RM 351 and RM 350, in what is now a community pasture. The community wants to bring the cranes back but if the land is sold, “the whooping crane will not be re-introduced to the Luseland/Kerrobert area.” The community needs the expertise of PFRA to do it. Candace also noted some positive developments since the federal government’s announcement. Communities of interest are coming together. Protect the Prairie began a petition campaign which more than 8,500 individuals from Saskatchewan and beyond have signed. The provincial government has vowed to place conservation easements on the pastures if they are sold. A ranchers/stewards alliance has formed to create a new management team for the pastures in southwestern Saskatchewan. The Saskatchewan Association of Rural Municipalities (SARM) passed a resolution calling on the province to “retain ownership” of the pasture lands. Still, it all seems too little to hold the grief. As Candace concluded, “There is wonderful life all around us, and we are its last best hope.” the regina mom hopes we are up to the task. Tomorrow, communities of interest are gathering at the Orr Centre, 4400 4th Ave in Regina from 8:30 to 4:30 pm to assess the situation and develop a plan of action. The event will be recorded and placed online. the regina mom will provide that link when it is available. The Federation of Saskatchewan Indian Nations also released an excellent backgrounder on the community pasture lands. Candace Savage is the best-selling author of Prairie: A Natural History and the 2012 recipient of the Hilary Weston Writers Trust Prize for Nonfiction for her latest book, A Geography of Blood: Unearthing Memory in a Prairie Landscape. With thanks to John Klein for his live-tweeting of the event which helped trm with this post. Let us send you Ryan’s book! 50 years ago, the Saskatchewan NDP took the bold step of introducing universal healthcare. 50 years ago, the Saskatoon Community Clinic, where Ryan works, was established to provide that care and defend the single-payer, publicly-funded system. Today, Ryan’s campaign is building on that legacy of big ideas and shared struggle. In honour of the 50th anniversary of Medicare, we’re asking 50 people to make a donation of $50 to help us build this movement. And as a gesture of our gratitude, we’ll send you something important in return — read on for details. We have been very encouraged by the generous support you’ve shown since Ryan launched his bid for the Sask NDP leadership. Your support has given our campaign huge momentum going into the holiday season. But you know that campaigns cost money, and the bills don’t stop just because the holiday season is approaching. So instead of just asking for another donation, we wanted to offer something meaningful back to you. 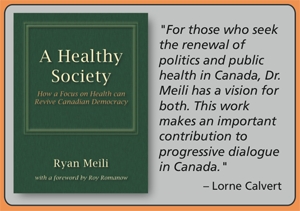 To celebrate the 50th anniversary of Medicare, for the next week we’ll send a signed copy of Ryan’s book, A Healthy Society: How a Focus on Health Can Revive Canadian Democracy, to everyone who donates $50 or more in response to this appeal. If you’re able to give $100, $150 or $500, you’ll be helping us cover the cost of sending books to people around the province and beyond, while still ensuring that we have the resources we need to run a winning campaign. To meet upcoming campaign expenses, we need to reach at least 50 donors in the next 7 days. We hope you’ll sign on so we can send you Ryan’s book. A Healthy Society proposes a new approach to politics, one that can help us put progressive ideas front-and-centre in addressing our shared challenges. Lots of people have contacted us to say they want to learn more about Ryan’s vision for a healthy society. His book is the perfect resource for inspiring us all to work together to make it possible. Help us celebrate the past 50 years, and shape the next 50 years, of progressive innovations in this province. Please take a moment to make a donation today, either online through our secure server or by calling (306) 361-5755, so we can send you a copy of Ryan’s book. p.s. Remember: we need to reach at least 50 donors in the next week — please take a moment right now to respond, and then please pass the message on to your networks. the regina mom posted this on Ryan Meili’s ideas page, in response to a call for ideas about building gender equity in SK. Ryan is the candidate trm is supporting in the SK NDP Leadership race. She is overwhelmed by and grateful for the positive support the idea is receiving. In the late 1980’s and early 1990’s the Saskatchewan women’s movement was a force to be reckoned with. Feminist organizations within the province had built a solid base from which to act and continue to build. The Saskatchewan Women’s Agenda* was the result of an intense, two-year, participatory process that brought more than 50 Saskatchewan women’s organizations together to determine what women needed to live full and equitable lives in this province. The Agenda addressed a broad range of issues, established goals and directed our work and the work we hoped to see a new government take on. But then came the feminist backlash. As a result, debt reduction gave way to creating a better world for women. Most feminist organizations faced slashed budgets from federal and provincial sources. Some groups folded. Others managed to hold onto shoestring funding and find other sources and stay alive. Feminists in Saskatchewan have not come together in a real and meaningful way since the mid 1990’s. Key organizers within the women’s movement have left the province or worse, passed on. Generational change is afoot in the organizations that managed to stay afloat and a key piece of our Saskatchewan women’s history, the Saskatchewan Women’s Agenda, is difficult to find, let alone study and pass on. In mid-October, Niki Ashton, Member of Parliament for Churchill and Opposition Critic for Women, hosted the Women’s Forum des Femmes which brought together a diverse community of women from across the country. Ms Ashton created a “space for women to share experiences, ideas, and shape collective plans for re-igniting the women’s movement in Canada.” Women who hadn’t connected since the 90’s were able to share their stories, many heart-breaking and anger-making, to reconnect with sisters in the struggle, to re-invigorate each other and younger feminists taking leadership in the movement and yes, to re-ignite the Canadian women’s movement grounded in wisdom, a passion for change and a commitment to make a better world. This is what the Saskatchewan women’s movement needs. Ms Ashton’s model can be easily adapted to the provincial level. The new Leader of the Saskatchewan NDP can make it happen. He can make it happen because he knows we are better together. *Note that I will upload the Saskatchewan Women’s Agenda as soon as a scanned copy is available.